Join The Wildlife Trust’s marine team on their epic Living Seas Wales roadshow tour of the Wales Coastal Path this summer! The roadshow kicks off at Aberavon Beach, Port Talbot and will then visit various locations in Swansea, Carmarthenshire, Pembrokeshire and Ceredigion before heading to north Wales for the last two weeks of August. Roadshow visitors are being told to ‘experience the unexpected’ with the incredible Sea Wales 7D augmented reality dome and there is a ‘splash’ warning too! If getting ‘wet’ isn’t your thing then how about exploring Wales’ amazing underwater world with the ‘Sea Quest’ and ‘Dolphin Dive’ virtual reality wildlife experiences. As well as an amazing display of digital wildlife, families can also get up close to some of our marine creatures that live on the shore with our cool coastal events. 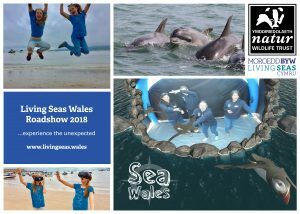 The Living Seas Wales team will also be collecting and recording your memorable marine experiences and stories. Living Seas is The Wildlife Trusts’ vision for the future of UK seas. The Living Seas Wales project is funded by the Heritage Lottery Fund, Visit Wales and players of the People’s Postcode Lottery. It will provide people with opportunities to learn about, enjoy and contribute to the conservation of the marine environment.